Empowered, confident, and powerful - Athena is the future of women's safety. The wearable tech device was created by ROAR for Good as an alternative to existing self-defense tools such as panic alarms, pepper spray, and tasers. At the touch of a button, Athena connects you with your inner circle when you need them the most. 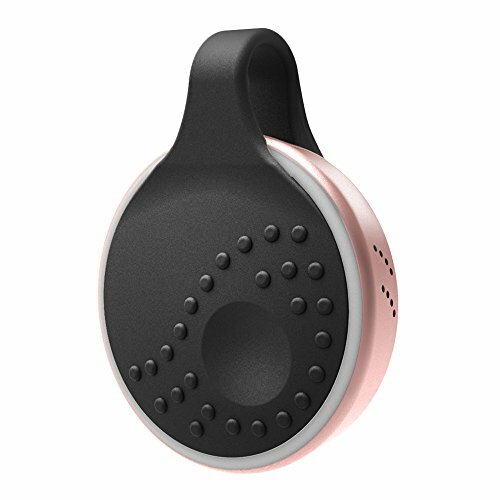 As seen on Forbes, Entrepreneur Magazine, marie claire, CNBC, Women's Running, Huffington Post, and more, this personal alarm for women-or anyone who wants some peace of mind-sends GPS notifications to your emergency contacts via a Bluetooth. Press once and hold to sound a high-frequency alarm and simultaneously alert contacts with your location. Or press three times to silently send a distress signal to your chosen contacts. Attach it to your purse, wear it as a necklace, or clip it on to your pants for some peace of mind. Athena is ideal for students, women in urban cities, real estate agents, runners, and those who work late at night. Athena has a 60-day return policy and a 1-year limited warranty. Contact our customer success team anytime at hi@roarforgood.com. PEACE OF MIND IN A SLEEK DESIGN: This personal safety alarm sends live GPS notifications to your pre-programmed emergency contacts. Press and hold to sound a high-frequency alarm & simultaneously alert contacts with your location. Or press three times to silently send a distress signal. WEAR IT YOUR WAY: On your purse, clipped to your clothing, or as a necklace - Athena is intentionally designed to suit your lifestyle, be easily accessible, and prevent accidental activation. LONG BATTERY LIFE: Athena uses a micro-USB rechargeable battery and lasts 2+ weeks on single charge. PURCHASE WITH PURPOSE: For each device sold, a portion of the proceeds to educational programs that have been shown to increase empathy and reduce violence. EASY TO SETUP, EASY TO USE: With just 3 simple steps and no recurring fees, your Athena will be up and running (smartphone & cell service required). It pairs via Bluetooth and the free ROAR Personal Safety app for iOS (9.0+) & Android (6.1+). View More In Clips, Arm & Wristbands. If you have any questions about this product by ROAR for Good, contact us by completing and submitting the form below. If you are looking for a specif part number, please include it with your message. © 2019 - kodefuguru.com. All Rights Reserved.